Let me start with a question. Is there any role on this planet that Meryl Streep can’t actually play? I only ask this because we’ve segued straight from a trailer for Suffragette, where she portrays Emmeline Pankhurst, to this little gem, where she plays Ricki Rendazzo, an ageing rocker, struggling to keep her dreams of stardom alive as she fronts a small time band (the eponymous Flash) by night and works by day at the checkout of an LA supermarket. And you know what? Streep absolutely nails it. 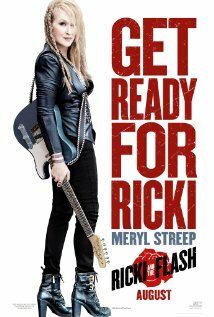 The film starts as it means to go on, with Ricki’s band blasting out a credible version of Tom Petty’s American Girl and for once, in a movie, this sounds like genuine musicians playing genuine music – as well it should, because Streep recorded her own vocals for this and she’s fronting a real band, featuring Rick Springfield as the new man in her life, Greg. When Ricki takes a call from her ex-husband, Pete (Kevin Kline), informing her that their daughter, Julie (Streep’s real life daughter, Mamie Gummer), has just been dumped by her husband and is feeling pretty low, Ricki heads back to Indianapolis, to try and mediate with Julie and to reconnect with her two sons, who have pretty much cut Ricki out of their lives since she broke up with their father. She also has to deal with Pete’s new wife, Maureen (Audra McDonald), a woman who seems to have been invented simply to illustrate the true meaning of perfection. Can Ricki have any hope of patching up all those wounds from the past? Or has she simply been away for far too long? This is a gorgeous film, perfectly pitched to avoid stereotyping and mawkishness. It’s cleverly scripted by Diablo Cody – the scene where Ricki sits down for dinner with her estranged family (including her son’s fiancee) is a comic masterclass – and there’s a resolution here that, in the wrong hands, could have come across as hopelessly sentimental but, guided by seasoned professional Jonathan Demme, is an absolute triumph. Cody has some history here. Her mother in law apparently fronted a rock band for years and that experience has clearly paid dividends. That odd title isn’t doing the film any favours at all, but you really should check this out. It’s a heartwarming tale about love, relationships and the redemptive power of rock n’ roll, well worth the price of admission.